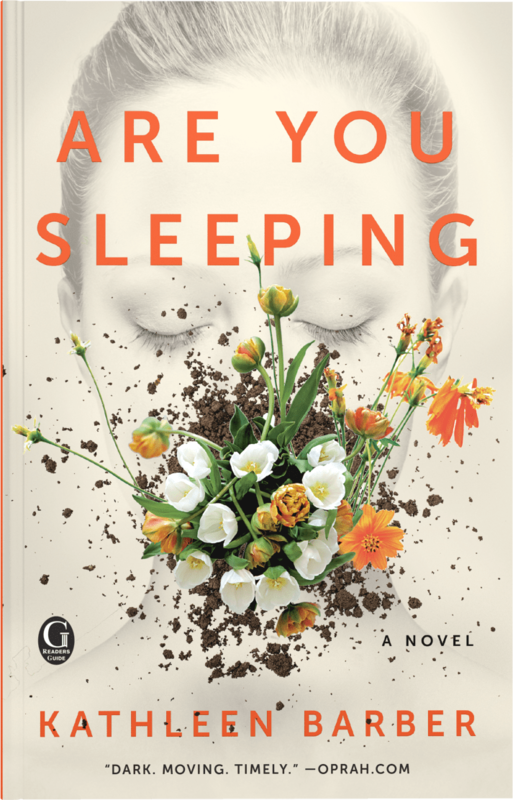 Let’s meet Kathleen Barber, author of the psychological thriller Are You Sleeping: she was raised in Galesburg, Illinois. She graduated from the University of Illinois and Northwestern University School of Law, and previously practiced bankruptcy law at large firms in Chicago and New York. When she’s not writing, Kathleen enjoys traveling the world with her husband. Doesn’t that sound good? But wait! There’s more! Are You Sleeping is being developed as a series for Apple. Created and written by Nichelle Tramble Spellman, the series will be produced by Reese Witherspoon’s Hello Sunshine and Chernin Entertainment/Endeavor Content. Octavia Spencer is set to star, and Sarah Koenig, the creator and producer behind true crime podcast “Serial,” will consult on the series. I am honored to have Kathleen Barber here today for Just Five Questions. She’s a fellow member of the Women’s Fiction Writers Association, and though we met briefly at a recent retreat in Albuquerque, New Mexico, I’m delighted to get to know her better here. If you haven’t yet read Are You Sleeping, I wholeheartedly recommend doing so soon. It’s a page-turning thriller, and I have a feeling that once the Apple television series is released, it’s going to be something everyone‘s talking about. No matter how many rejections I’ve accumulated (and it’s been a lot), I’ve never had a problem continuing to write. Writing is so inherent to who I am that I can’t not write, and so, while rejections have dented my self-confidence at times, they’ve never stopped me from writing. Continuing to submit work to agents and for publication, on the other hand, was a bit more difficult. Ultimately, I kept doing it because I felt like I had nothing to lose. Sending email queries cost me nothing but time, and the potential for reward was so great. After the first dozen rejections or so, I realized that no agent was going to send me a personalized note telling me I was the worst writer she had ever seen or otherwise mock me, and that realization helped melt any remaining reluctance I had to continue querying. I did spend a couple of years querying a coming-of-age story before I wrote Are You Sleeping, and I eventually pulled that one from queries once I was ready to query AYS. I still really like that first story, and I still work on it sometimes, but now I write it just for myself. What methods do you use to balance the quiet life a writer needs to work with the necessary business of being a person with friends, family, and social responsibilities? I’m extremely lucky in that I’m able to write full-time right now, so I treat writing as though it’s a more traditional job: writing during the customary workday, logging the time I spend writing and doing other writing-related tasks like book promotion, and limiting the amount of non-writing things I do during “work hours.” It’s an ideal set-up and I feel really fortunate to have it—when I was working full-time as a lawyer, the balancing act was much different and much more complicated. Back then, the only way I was able to get any writing done was by carving out a weekend day to spend on writing and ignoring everything else. I once read this profile of Wendy Williams, and it included a mention of how she takes (or did, at the time this article was written) Sundays for herself. She spends so much of the rest of the week working and being “on,” but on Sundays, she doesn’t leave the house and instead spends the day in her private room doing only what she wants. I’m paraphrasing here because it’s been years since I read this, but the general idea stuck with me and was the model for how I would fit in my writing when I was working full-time: On (many) Sundays, I didn’t leave the apartment, and I just worked on my writing. I think a lot of busy creative people reading this will appreciate the permission to take that time for themselves. Speaking of time, what is your morning routine? I don’t keep a set routine—I let how I’m feeling that morning dictate how my day begins. Some mornings I wake up with an idea in my head and ready to jump directly into work, and some mornings I need a bit more time to get going. The one constant, however, is that I always start with breakfast! I have never understood people who don’t eat breakfast; I always wake up starving. I usually have an English muffin with peanut butter, an apple, and some coffee, and that keeps me fueled for a morning of writing. When I’m really deep in writing a story, I tend to get annoyed at having to pause to eat and am tempted to just nibble on animal crackers all day. I try to combat that with smoothies—I like to make a smoothie with almond milk, spinach, banana, and frozen berries, and that’s convenient because I can just sip on it while I work. Depending on how hungry I am and what else I’ve eaten that day, I might add some peanut butter for protein. The aforementioned animal crackers are definitely a food vice—I buy them in those big tubs from Trader Joe’s, and it’s so easy to nibble on them all day. Also, those chocolate-covered acai-blueberry things are a huge downfall of mine. When I buy them, I hide the bag so my husband doesn’t see how fast I go through them—it’s embarrassing! Thank you to Kathleen Barber for bringing such honesty and writing encouragement to leahferguson.net (not to mention that gorgeous cover of the Are You Sleeping paperback). If Trader Joe’s suddenly wonders why its sales of chocolate acai-blueberries have gone up, at least we’ll know why! Are You Sleeping can be purchased through Amazon, Barnes and Noble or Indiebound (and as always, if you can take a moment to leave a review on a book you’ve read and enjoyed, it is very much appreciated!). Learn more about Kathleen at her website, or through Facebook, Twitter and Instagram.